Ok, I re-read everything and yea I have to admit, it does look like Zodd is duckin outta the way. Yeah. The horn's shape is characteristic. It just screams his name. To me, this raises more questions than gives answers, and it's dangerous to go supposing a bunch of things about the situation based on this one panel for which we don't know the context (like, if Griffith is actually there or not). Of course, this all has yet to be confirmed. It's still clearly just speculation. But in the end, considering all the "coincidences" and if we take into consideration the nature of the child, his attitude, his powers, how Casca reacted to him, the episode titles, and what Miura showed us in volume 22, it feels natural and logical to think he's simply Griffith to me (now how the child/Griffith combo works is another question altogether, and stays completely open for now). Anyway we can favor a theory without refusing to consider others, and I think it'd be wrong to assert that it has nothing more going for it than other alternatives such as "Zodd stumbled on them while checking on the progress of Daiba's fleet." IMHO this definitely brings a new light and perspective on the events that took place as well as the future development of the story, and I have a feeling the most exciting, interesting and spelled out explanation is the good one. PS: Sorry for only leaving you the role of the bad guy. I have to admit Aaz, when I first started reading this thread I wasn't going to bother with it. But after looking at that panel again, it does seem pretty obvious that, that is Zodd in the background. The cloud behind him is totally a framing device to make it more noticable. On the other hand though...alot of stuff discussed feels like a "what if Skullknight is Guts from the future?!!!!" theory that the child is Griffith. Obviously he is related to Griffith...literally. But although you raise fairly valid points, I'm gonna have to see to believe on this one. Amazing find though. No one reads Berserk like Aaz. *jumps cautiously on the band wagon* The implications are huge, but there is still some way to go before we can verify any theory. We will probably have to wait at least till the next full moon for futher evidence. Though whichever direction Miura decides to take this, I'm sure it will be crucial for the whole plot. alot of stuff discussed feels like a "what if Skullknight is Guts from the future?!!!!" theory that the child is Griffith. Obviously he is related to Griffith...literally. Well then how exactly is he obviously and literally related to Griffith if the idea seems totally ridiculous to you (which is what the "SK is Guts from the future" joke is)? It seems somehow contradictory to me. Plus it's just a kid that showed up on the beach, maybe he's the Hanafubuku Ô.
although you raise fairly valid points, I'm gonna have to see to believe on this one. We will probably have to wait at least till the next full moon for futher evidence. 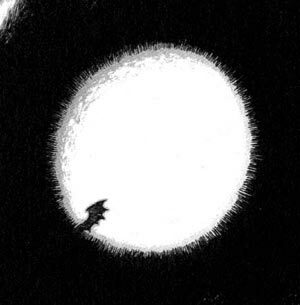 Well, we've seen Griffith with the moon (not full) in the last page of 258... Another hint?! Now to argue against myself a bit, I'd say that the fact the Brand didn't react at all is odd, and that I'm not convinced it could be suppressed. Yet Schierke didn't feel anything either in spite of the Child's incredible power (except for a vague "strange Od" emanating from him), so that argument retains some validity because it's very strange overall. But there's also his astral representation. It's clearly a kid, not a Hawk or anything. So that means it changes automatically, can be changed by the child/Griffith, or that both are separate entities. It seems to be made of solid light though, that could easily be related to Griffith again. And it also "appeared" suddenly when the group was in danger, as if the Child had chosen to reveal his power because he had no other choice. That lends more strength to the "suppressed power" theory. Bah. On that note I was trying to see the moon in the last few episodes, but was unable to, which doesn't prove anything because it's probably been a week (manga time) betwen ep.258 and now. Who knows maybe Zodd is on a stork-like mission yet again (though he doesn't appear to carrying anybody, the child itself could be near). It should still be about the same, although it looks like a crescent behind Serpico in episode 261 (but it looks at least three quarters full in 264, if what the Pontiff sees is real). it's probably been a week (manga time) betwen ep.258 and now. Actually, it's only been a few days. Based on the continuity shown in the manga, 3 days have passed since the night on the beach and until now. Brilliant sleuthing Aaz, it's a very sound theory. At first I thought the panel showing Zodd's silhouette was reaching a bit, but looking at my copy of the manga it does look pretty convincing. The horn and tip of the wing are irregular shapes in comparison to the rest of the rocky cliff. I'm still not sure on the werewolf aspect of Griffith turning into the moon child. 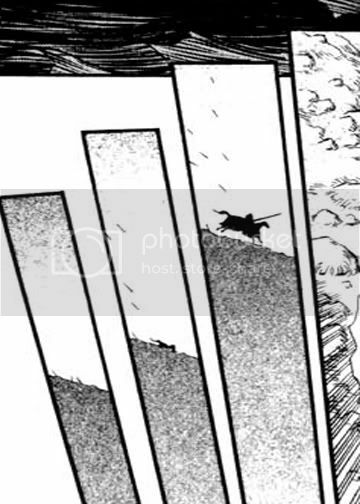 In vol 27 (not sure which episode) when Zodd and Griffith retreive Charlotte, there's a two-page spread of them flying over what looks like a full moon. Now judging by the continuity, this would be around the night before the moon child's appearance on the beach, so it is conceivable that Griffith was close to transforming, although it would have to be right after they drop Charlotte off. Considering the effects of the moon, maybe the child only appears when Casca is menstruating and has more to do with her than with Griffith. I don't think so though. As for why the moon has any sort of power over Griffith now may have to do with how the Eclipse works. When the moon blocked out the sun before it meant time for the birth feast. Brilliant sleuthing Aaz, it's a very sound theory. Thanks, and thanks to everybody else too. I'm still not sure on the werewolf aspect of Griffith turning into the moon child. Haha well, while it's an interesting idea for now it's still 100% speculative (I think Rhombaad was really just tossing the idea out there), so I can't blame you for that. I find it pretty plausible nevertheless, and I think it'd be cool if it ended up being true. That would allow a lot of interesting development for the plot. I'm still open to any other eventuality for now anyway (as I think we should all be). It was almost a full moon but not quite. This is made clear by the shot of Zodd's wing in front of it that Locus sees, among others (it can also be seen through Charlotte's window for example). So it fits with the continuity, it could have been a few days before the events on the beach. Concerning what you said about Casca's menstruation I'll have to agree that it seems unlikely for now. I also see the phenomenon as having more to do with the Child himself than other people (like Casca or Guts). And about the moon's power and the Eclipse... That's the first thing that comes to mind of course, but I'm not sure it's pertinent. If anything the defining element should have been present during the Incarnation ceremony, and while it mirrored the Occultation no real solar eclipse occurred. It's still interesting in this regard even if trivial though, and could also be linked (albeit superficially) to SK's analogy of the events taking place at the time (that world being the reflection of the moon on water, and Guts having to create ripples to change the events). Hmm well I'll stop this post now since otherwise I feel like I'll just start rambling. Hey Aaz, I didn't mean to offend in any way by my comparison. I give your theory alot more credit than the SK one hands down. I was just being sarcastic. I totally agree the silhouette is Zodd, especially with that last picture you posted. The werewolf theory isn't working for me so much, but I do think it's pretty cool. Like I said, I'm just gonna wait to see what happens with that one because at this point it's a little tough to say how exaclty the whole thing physically would work...not to discredit it...but solely on the fact that at this point we don't have a ton of facts. If you are 100% right though, I think it'd be amazing for the story and you would be the man. I was also wondering if possibly we may be leaving out some details on Zodd's involvment though...? Is he just a big lug who can't fit behind a hill while babysitting or do you think there's more to his involvment that could maybe even add a new dynamic to his character? ps - I think Skully and Guts should go for coffee and catch up. Hey Aaz, I didn't mean to offend in any way by my comparison. I give your theory alot more credit than the SK one hands down. I was just being sarcastic. Ok, that's cool. I thought you didn't mean it in a bad way but in doubt I preferred to make it clear since to me the comparison pretty much meant "it's worthless." I'm just gonna wait to see what happens with that one because at this point it's a little tough to say how exaclty the whole thing physically would work...not to discredit it...but solely on the fact that at this point we don't have a ton of facts. Yeah, I can understand that like I said. It's all still mostly conjectural for now. I was also wondering if possibly we may be leaving out some details on Zodd's involvment though...? Is he just a big lug who can't fit behind a hill while babysitting or do you think there's more to his involvment that could maybe even add a new dynamic to his character? I'm glad you mention that actually since nobody really commented on it besides me until now. I think this further proves that Zodd is more knowledgeable and plays a bigger role than one might think at first. To witness such things and remain quiet about them, to appear as often through the series "observing" events as he does... It places him next to SK. One goes, the other arrives, literally. Not to mention all the little talks they have. When I think about his comment on the Berserk's armor in volume 26 it really makes me wonder how long he's really been around and what he's seen. So to answer your question I don't think this adds a new dynamic to his character, but it confirms what we've been suspecting for a while: that there's more to him than meets the eye. I also do think he's a big oaf who can't hide behind a hill while peaking at people though (and actually Griffith and I were joking about it this morning). When Mule and Sonja return to the campsite, that was episode (goes to check)...ep 258, the last page is Griffith staring at the moon, reinforcing the whole importance of the moon. (P.S.) This episode was later removed if I'm correct right? Was it because Miura felt it interupted the pacing or some other reason? It wasn't removed, it was just moved ahead to volume 29, after Sonia and Mule leave Vritannis for Griffith's camp. Miura just put it in a different order than it came out in YA. He did this before with episodes 177 and 178. When Mule and Sonja return to the campsite, that was episode (goes to check)...ep 258, the last page is Griffith staring at the moon, reinforcing the whole importance of the moon. This episode was later removed if I'm correct right? Was it because Miura felt it interupted the pacing or some other reason? It's still interesting in this regard even if trivial though, and could also be linked (albeit superficially) to SK's analogy of the events taking place at the time (that world being the reflection of the moon on water, and Guts having to create ripples to change the events). Useless conjecture or not, there's a lot out there that can be connected. It just depends on if you're searching for it with a biased frenzy, as I'm prone to doing. I'm glad you brought this up. I know you think I take the analogies too far, but in the Berserk world it really seems that they could be read as hints as well. Like Griffith said, there's a difference between analogies that are explicitly written in the story and when you're just inventing them to produce some useless and baseless conjecture. Now I'd like you not to pollute this thread to try to bring some half-assed justification to what you were saying in another one, since you apparently have nothing to say that's on topic. You could always quote this thread in the Underlying Vein one if needed. Thanks in advance. There's often direct proof of things. Then there are things that can relate, with a various degree of superficiality. And finally there's stuff that's just really far-fetched and unrelated. Everything can be connected. It just depends on how far you're willing to take things. But in the end to connect unrelated stuff to relevant one just because you think it's fun weakens the original point, like I told you before. I happened to come accross this tonight....volume 21, page 226-227. Looks like Miura was prepping us for the little Zodd and go seek game in vol. 28 and we didn't even know it. Well, that's just Guts and Casca fleeing on horse and the focus is on them, so actually I'm not sure it's directly related. That makes me wonder if we can play "Where's Waldo?" with Zodd through all the volumes though. Anyway, the topic is still open to speculation guys, don't hesitate to share your ideas! I was just pointing out that it was a very similar looking shot, and the same type of technique only this time, revealed what was behind the hill because there's no reason to really hide it. I think Miura may have put it there to train the reader's eye to notice that type of thing if Zodd really was the second gunman. Yeah, I know what you meant, but like I said I don't think that was it. With 6 volumes in between and all, plus the fact we've seen some of this stuff before at regular intervals, I don't think there was a conscious effort from Miura to hint at the reader he'd do the same thing again 4 years later. However, and I don't think we've talked about it in this thread yet, this could be related to what Zodd did in volume 8 during the battle of Doldrey (though it might not have any real significance in regard to the present case). Well, it wouldn't be impossible for him to improvise it into a script he's already written. In fact, that type of thing looks like something he came up with as an afterthought. I'm sure he has most of, if not the whole story already mapped out. I don't think it's impossible to assume he could've looked back on previous volumes if he didn't think to do it from the beginning. This isn't a big deal though. I thought it might be a neat tidbit for people to check out all the same. If we're going to fly off the handle thinking Griffith is like the holy trinity/werewolf I don't think it's too far fetched to say those panels look very much alike and are obviously in place to serve some purpose. In this case I think it is to demonstrate how a future clue might work/appear. Thats all from me. Now I'd like you not to pollute this thread to try to bring some half-assed justification to what you were saying in another one, since you apparently have nothing to say that's on topic. I'll try to keep those categories in mind.